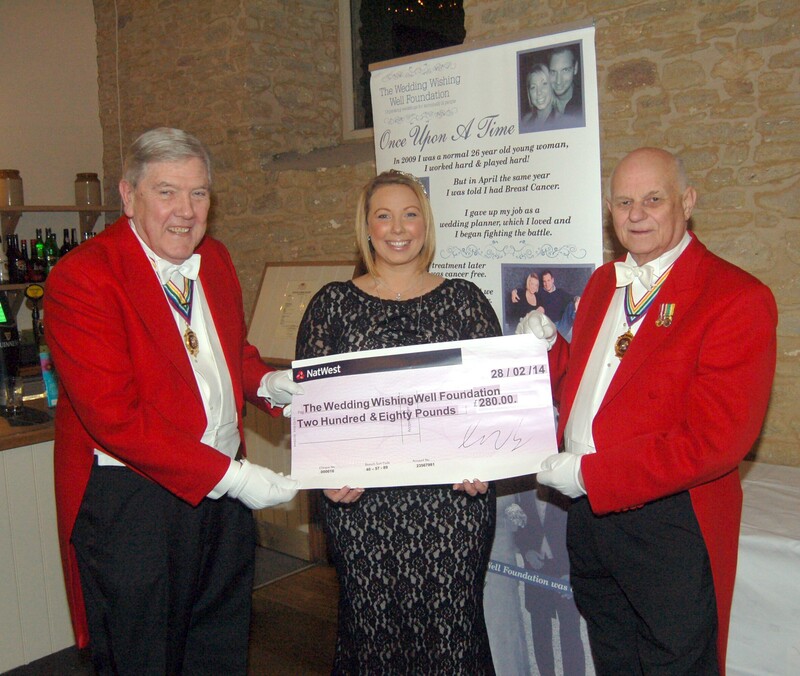 We would like to say a HUGE thank you to an absolutely amazing couple who recently donated a breathtaking £10,000 to the Wedding Wishing Well Foundation – a repeat of their generosity from last year. You know who you are, and we really cannot say thank you enough. You are helping to change so many lives. We have also had a fantastic donation from Silk and Satin Weddings – £102.50, to be exact. Again, this is another brilliant effort, and we are so, so grateful that you have taken the time to help us. If you fancy overcoming a fear of heights or simply want to help a good cause, we are still looking for participants for our charity abseil on 17th May. Contact info@weddingwishingwell.org.uk, or visit our Facebook page for more information. It seems like only yesterday that the winners of the 2014 Bristol and Somerset Wedding Awards were being announced, but we can confirm that plans for the 2015 celebrations are already in motion! Watch this space for the next announcement. To keep up to date with the latest news, please follow the dedicated Facebook page – don’t be the last to know! No Ordinary Wedding Planner – pre-order today! This is just a quick reminder that Naomi’s book, ‘No Ordinary Wedding Planner’, is available to pre-order on Amazon.co.uk. Due to be released on 6th June 2014 (Naomi and Graham’s second wedding anniversary) by HarperTrue, the book details Naomi’s life with cancer and her inspirational mission to help those around her. This is the inspiring story of Naomi Thomas, a secondary breast cancer sufferer who has decided to devote the remainder of her life to spreading joy, helping others to find happiness by fulfilling the wedding dreams of those who are terminally ill.
Naomi was 26 when she was diagnosed with breast cancer. Her boyfriend Graham had proposed just two days earlier. After seven months of treatment Naomi was declared cancer free, only to receive the devastating news a few short months later that the disease had returned and was no longer curable. Her son, Devon, was just six days old. Thoughts of their wedding were the one thing that kept Naomi and Graham going, but the financial burden of terminal illness had made the reality of their special day seem impossible. However, in this time of darkness, the couple discovered the amazing generosity and selflessness of local companies as they rallied around and helped to organise and fund a dream wedding. Their kindness was overwhelming. Determined not to die in vain, Naomi began fund-raising, ultimately setting up her own charity with the mission of spreading the joy she had experienced on her big day. The Wedding Wishing Well Foundation was formed, and Naomi now organises and funds weddings for those affected by terminal and life-limiting illnesses, helping them to enjoy married life before it’s too late. Inspiring, heart warming and incredibly moving, this story will show you the true meaning of love. To pre-order your copy of ‘No Ordinary Wedding Planner’, please click here. Your copy will be sent directly to your phone, Kindle, or e-reader on the 6th June. How exciting! We are thrilled to announce that the total raised at the Bristol and Somerset Wedding Awards was over £1,200 – wow! This amount was achieved via an auction, raffle, and through donations made during the hilarious games of Heads and Tails. A huge thank you to everybody who was involved in the organisation and hosting of the awards, as well as every single guests in attendance. You helped to make the event unforgettable and successful experience. Keep your eyes peeled for next year’s event, which will be announced in due course. Ever fancied helping out at the Wedding Wishing Well Foundation? Here at the office we are looking for a volunteer to give approximately 6 hours (or more, if you would like) per week unpaid work to the charity. The ideal candidate must be able to get to the office in Wellington, or possibly Exeter, for a designated number of shifts per week. You should be computer literate, with a good knowledge of Word, Excel, and Dropbox, as well as being passionate about the work we undertake. It is essential for candidates to demonstrate a caring and compassionate nature, due to the nature of our charitable work, and our ideal volunteer will also be able to demonstrate a polite and confident telephone manner. Before you consider applying for this vacancy, please bear in mind that you must be able to commit to this position on a longterm basis. Days and hours of work can flexible to a certain extent. We look forward to hearing from you, and meeting you soon. At the Wedding Wishing Well Foundation, we are always excited to hear about your fundraising efforts – nothing makes us smile more than hearing about your dedication to raising funds for our organisation. Just in case you were searching for inspiration for your next event, though, we thought we’d share a few upcoming fundraisers with you – see how these tickle your fancy! The London 2 Brighton Challenge gives participants the opportunity to walk, run, or jog the 100kms from Richmond, West London, to Brighton. Take in the sights, make some new friends, and push yourselves to achieve something that little bit special. A new challenge of 56km, from Richmond to Tulley’s Farm, Turner’s Hill, has been added to the challenge this year for those who want to break themselves in gently. The challenge is due to begin on the morning of 24th May 2014, with many participants hoping to complete the course within 24 hours. Covering a distance of 5km, The Bridgwater Half Marathon will be taking place on Sunday 7th September 2014. Again, walkers, joggers, and runners are invited to participate in this fantastic event, raising money for a great cause while having lots of fun. Always fancied being a superhero? Well now you can be, and while raising valuable funds for the Wedding Wishing Well Foundation – it doesn’t get any more super than that! The annual Super Hero Run 2014 will be taking place in London’s Regent’s Park on 18th May. A registration fee of £22 is required, although this will include a FREE super hero outfit for all participants. We’re pretty sure that fundraising has never been such fun. Taking place on the 27th April 2014, The Plymouth Half Marathon passes by some of the city’s most famous and beautiful sights and monuments. What could be better than raising money while treading the coastal paths, navigating the famous harbour, or rambling through some truly stunning National Trust land? We’re stumped too! We are looking for teams and individuals who would like to enter any of the above in our honour. Please contact info@weddingwishingwell.org.uk to register your interest, or to let us know what you will be doing to raise money for the charity. Details of further fundraising events can be found here, along with all the information you need about getting involved. Entries to the Bath Half Marathon, as run by Zoe Bromiley and Mike Parry this year, are now open too – never has there been a better time to get fit. Zoe and Mike raised a fantastic £145 for us during their Bath Half, and we couldn’t be more pleased or proud of them. We would like to take this opportunity to say a huge THANK YOU to the Executive Guild of Toastmasters and Town Criers for their amazing donation of £280. The Guild, including member David Stallworthy, has done a tremendous amount for us over the last couple of years, so we are over the moon with their generous cheque, which was presented to Naomi by Vice Presidents Peter York and Eric Gill on the evening of the Bristol and Somerset Wedding Awards. Additionally, we were delighted to hear that President Bob Bayliss has nominated the Wedding Wishing Well Foundation as his charity of the year. We were, of course, thrilled by the news, and look forward to an exciting year working with this fantastic Guild. We really cannot rate the Guild’s members highly enough and suggest you consider them for your next event.